Leading Change. Transforming Communities. We are the Junior League of Orange County, CA. We’re very excited to invite you to learn more about our service and training organization for dynamic women in Orange County. 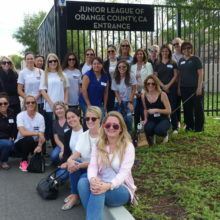 The Junior League of Orange County reaches out to women of all races, religions and national origins who demonstrate an interest in and a commitment to voluntarism and to the community. Our members come from varying backgrounds and interests and include executives, community leaders, entrepreneurs, mothers and professional women who share a commitment to voluntarism and developing the potential of women. The JLOCC is open to women ages 21 and older who express interest in voluntary community participation. There is no upper age limit.